A friend, in 1984, announced that Supertramp had a new album out. I had to inform him that it wasn’t the case. 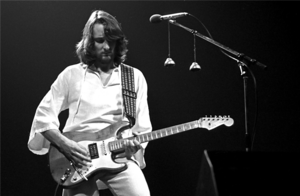 Instead, thanks to the single, “Had a Dream (Sleeping With the Enemy), getting a fair amount of airplay on radio, I could tell him that former Supertramp guitar/vocalist Roger Hodgson had released his first solo album. One point to me, I think. Besides, my friend was a total Duranie and very anti- heavy metal. 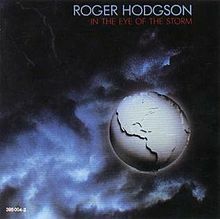 I still feel the same way about Roger’s debut album, “In the Eye of the Storm,” now as I did back then. It could have been another Supertramp album. It became abundantly clear to me that Roger was the driving force behind the band and with his solo album, it was pretty much the same. Not that it’s a bad thing because it’s not. I’ve always liked Supertramp’s version of 1970s progressive rock. Nice keyboard work laced with some guitar done very creatively over rather long songs. I have this memory of Supertramp songs usually being in excess of five minutes, except for a few of the ones released as singles. It is the same on Roger’s album. Four of the seven songs are over seven minutes long and one is just a second below six. In a musical world where synth pop was emerging, I thought it was great to still hear some good progressive rock. Though unusual for me, I have to say that “Had a Dream (Sleeping With the Enemy) is my favourite track. I liked it enough when radio cut huge chunks out of the song for airplay so the full eight minute plus version was even better. The entire progressive rock arsenal went into making this one. Some great keyboards with bouts of both acoustic and electric guitar with Hodgson’s unmistakable vocals. It all adds up to a great song. Of course, there are other nice songs too. I do like “In Jeopardy” as it is more classic Supertramp. “Hooked on a Problem” is an interesting one. The introduction reminds me of the classic, “The Logical Song” but transforms into sounding like a carnival. I would be repeating myself if I dissected every song, except for “Lovers in the Wind” which does nothing for me personally and credit where due, Roger definitely chose the right song for the closer. Except for where noted below, I thought it was cool that he got Michael Shrieve of HSAS fame to play drums on the album, Roger plays all of the instruments himself on the album proving what a fine musician he is. Thinking back, I now realize that there was more great progressive rock back in the mid 80s than I allowed myself to believe. This debut album from Roger Hodgson is indisputable evidence of that. It often pays to be in the right place at the right time and in the case of the Outlaws “Los Hombres Malo” album, I was fortunate to be in the south when this album was released. Otherwise, it might have passed me by. 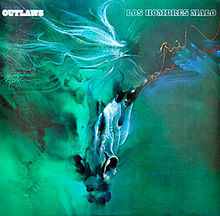 “Los Hombres Malo” isn’t one of the Outlaws’ better known albums like “Ghost Riders” or “In the Eye of the Storm” or in fact, some of the classic albums they made in the mid to late 1970s. All that aside, it’s still a pretty good album. The Outlaws have never been as heavy as Southern Rockers such as Blackfoot or Molly Hatchet. Their sound is more bluesier with some great long lead guitar solos like their all time classic jam, “Green Grass and High Tides.” It is more of the same with “Los Hombres Malo.” “Don’t Stop” is a classic Outlaws type song and opens the album quite well and it’s followed up by the similar sounding “Foxtail Lilly.” “Rebel Girl” is the only song I remember getting any airplay, even on southern stations and it is a decent song except that the guitar solo isn’t as long. My assumption: they were asked to shorten the lead for airplay. The rest of the album goes back to the more traditional Outlaws sound and if, while listening to it, you think that every song is in the same vein, the album throws a curve ball with the more slower “Running.” It’s a ballad done the Outlaws’ way. “Easy Does It” and “All Roads” end the album just fine. While this album doesn’t make me want to forget some of the more classic albums, it doesn’t make me want to discard it for them either. One event I regret missing in 1982 was that the Outlaws and Blackfoot toured together. That must have been an amazing show. They would have played some songs from “Los Hombres Malo” and that would have been cool. Next post: The Top in in Israel, in April 1982. Throughout the 1970s, while Yankees like me were reveling in the Southern delights of Lynyrd Skynyrd and The Allman Brothers, there was another band down in the Deep South playing some fine rock and roll to their fans down there. They were The Outlaws. They had a more of a Southern Boogie rock sound, not as hard as Molly Hatchet or Blackfoot nor were they progressive like Nantucket. The Outlaws, in my view, laid somewhere in between the Allman Brothers and Lynyrd Skynyrd. What they did have, like all the bands I just mentioned, were guitarists who could dazzle you with long guitar solos. My indoctrination to them was through their 1980 album, “Ghost Riders,” an album I will definitely be visiting it when I get to 1980. Therefore, I am visiting the 1979 album “In the Eye of the Storm” kind of regressive and thanks to the wonders of You Tube, I was able to have a listen and see what I’ve been missing for all these years. 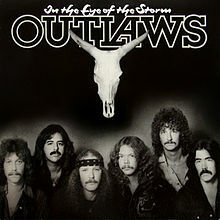 “In the Eye of the Storm” for me reminds me of all the good things about The Outlaws. There’s the Southern Boogie sound in all of their tracks, I noticed that from track one. They bring a harder edge to it with songs like, “Miracle Man” and “Long Gone” and then there’s those cool guitar solos in “Blueswater.” This album gave us a good view of all the good things to come with the later Outlaws material and is a great album in its own right. The Outlaws were to finally get noticed north of the Mason-Dixon Line with their next album, but they still thrilled many of their fans south of the line with this one. This album is yet another fine classic rough diamond in the collection of Southern Rock.